Warren Strain of the Mississippi Department of Public Safety said at a news conference that the officers were called to a house in the city of Brookhaven at about 5 a.m. for a report of shots fired. Amid an exchange of gunfire, both officers were “mortally wounded” and then pronounced dead at a local hospital, Strain said. He identified the weapon used as a handgun but would not elaborate. Authorities identified the deceased officers as Patrolman James White, 35; and Cpl. Zach Moak, 31. Both were wearing bulletproof vests at the time and were equipped with body and dashboard cameras. White arrived on the scene first, and Moak arrived next. A suspect was wounded in the exchange and taken for treatment to a hospital in Jackson. Police identified him as Marquis Flowers, 25, of Brookhaven. “These are two awesome people who lost their lives this morning in the line of duty. Two heroes lost their lives this morning,” Collins said. Strain said the investigation is in its initial stages. A number of people have been questioned in the case. The Mississippi Bureau of Investigation is working the case, in addition to other agencies. This is the second time in as many years that a law enforcement official has been killed in the line of duty in the Brookhaven area. Last year Lincoln County Sheriff’s Deputy William Durr, who also spent four years with Brookhaven police, was responding to a call when he was shot to death. 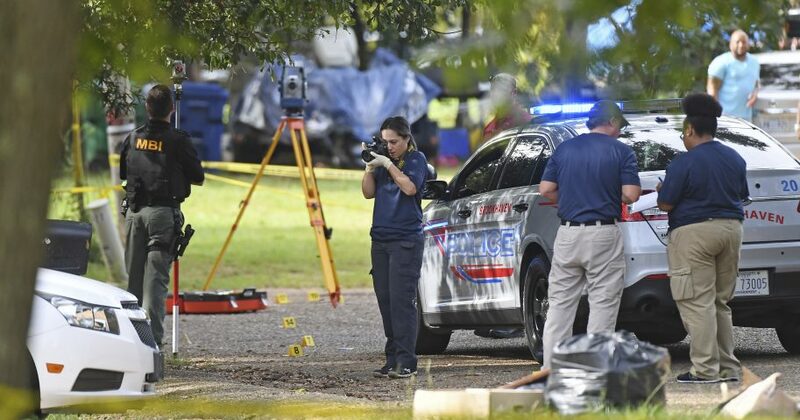 Authorities say the gunman shot and killed seven other people in the killing spree in and around the Brookhaven area. Willie Cory Godbolt was arrested May 28, 2017, and is awaiting trial. He’s pleading not guilty and faces the death penalty if convicted.